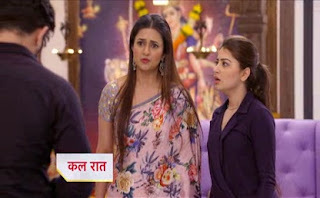 Home Yeh Hai Mohabbatein Yeh Hai Mohabbatein 25th June 2018 Episode Written Update "Roshni is Kidnapped by Param"
Yeh Hai Mohabbatein 25th June 2018 Episode Written Update "Roshni is Kidnapped by Param"
episode starts with Parmeet makes a plan to kidnap Roshni. He tells Simmi that Romi is in need of money, everyone will doubt on him, but they can have the money from Raman by framing Romi. Simmi likes his plan. He tells her that he will manage everything. Raman justifies to Ruhi that he didn’t get selfish, he is just concerned for his parents who wants to get Adi’s child. Ruhi tells him that he will talk to Romi. She reveals that Ishita is taking safety measures for Roshni. Raman feels Ishita doesn’t trust them, even when they gave her a chance after Adi’s loss. Raman gets angry on Ishita as she is failing him yet again. Parmeet gets to overhear them. Parmeet takes advantage of the matter. Raman tells them that they can’t get the baby home without giving financial security. Ruhi gets ready to name her property to Roshni’s child. Raman feels Ishita has made Ruhi selfless like her, and he gets grateful to Ishita for instilling good values in his children. He thanks Ruhi for becoming his strength. He doesn’t want to take any property from Ruhi. Ishita makes sure that Roshni is fine. She asks Roshni to take care and makes a leave for clinic. Parmeet reaches there in disguise and kidnaps Roshni by making her fall unconscious. He acts like he is taking her to the hospital and fools the security guard. He gets happy that he is able to execute his plan with ease. Raman gives the company papers to Mihika and asks her to give the papers to Romi, as he doesn’t want to lose Romi after losing Adi. He asks her to convey to Romi that he loves Romi a lot. He asks Mihika to move out with Romi if they are happy, but he doesn’t want Romi to end ties with them. Mihika apologizes to him. Parmeet and Simmi lock up Roshni in the godown. He tells Simmi that none can know his crime, as Romi will get trapped by the clues left. Aaliya offers the shares gifted by Adi to Raman and tells him that Adi’s baby has the right over the shares. She asks Raman to take the shares, as she is happy to name it to the baby. Raman asks her to think again and not be emotional. Aaliya tells him that she is sure about it. Ishita learns that Roshni isn’t at home. She rushes home to find Roshni. She panics on not finding Roshni at home. She realizes that Roshni got kidnapped. She gets Romi’s kerchief there and gets a huge shock. PRECAP : Ishita comes to Bhalla House to Search Roshni Raman tells She is not here and We should Ask Param and Simmi. Ishita tells him to ask Romi Before them.